For any first course in Federal Taxation at the undergraduate or MBA level. 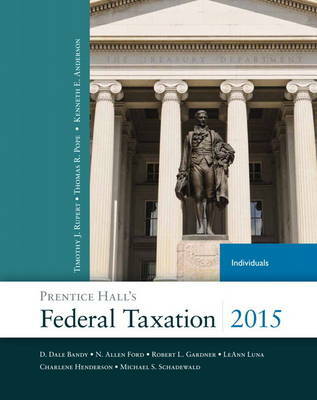 MyAccountingLab ® for Prentice Hall's Federal Taxation 2015 is a total learning package. MyAccountingLab is an online homework, tutorial, and assessment program that truly engages students in learning. It helps students better prepare for class, quizzes, and exams-resulting in better performance in the course-and provides educators a dynamic set of tools for gauging individual and class progress. This program presents a better teaching and learning experience-for you and your students. Personalize Learning with MyAccountingLab: MyAccountingLab not only gives students more "I Get It" moments, but gives instructors the flexibility to make technology an integral part of their course.Help Students Master the Material with Strong Pedagogical Aids: Accessible learning aids enable students to apply tax principles within the chapter to real-life situations.Keep Your Course Current: This edition is updated to include 2013 and early 2014 information. Note: You are purchasing a standalone product; MyAccountingLab does not come packaged with this content. If you would like to purchase both the physical text and MyAccountingLab search for ISBN-10: 0133822257/ISBN-13: 9780133822250. That package includes ISBN-10: 013377208X/ISBN-13: 9780133772081 and ISBN-10: 013381307X/ISBN-13: 9780133813074.